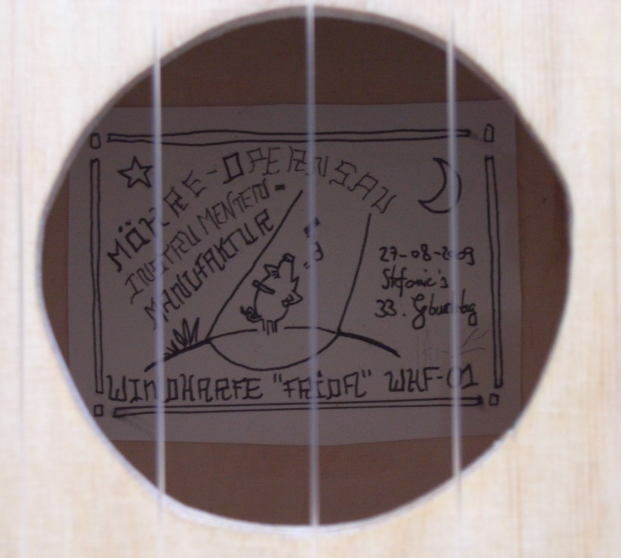 The above drawing of an Æolian harp was drawn by Bruce Taylor (using Windows Paintbrush) and posted on rec.music.maker.builders many years ago. The tuning pins are harpsichord tuning pins and the hitch pins are any type of attractive headless nail. Pre-drill holes for both (first in an off-cut!) Both Bruce and I would like to know of harps built using this plan. See below for the stories and pictures of some. 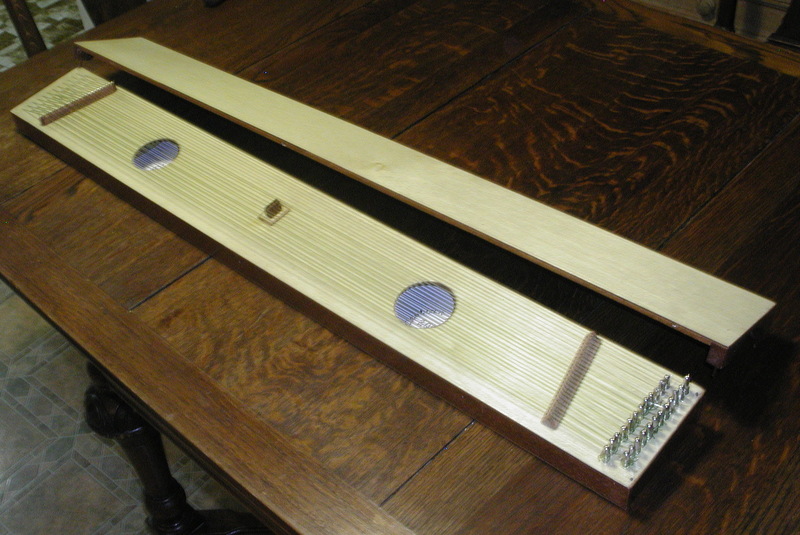 This type of Æolian harp fits into a sash window and the length of the instrument is tailored to fit the window. In use, the sash is lowered onto the cover, forcing all the draught across the strings. A fairly strong blast of well directed air is required. Scientifically, we are looking for a laminar air flow. Tune all the strings to the same pitch, but each string should be of a different diameter. I had success using various nylon guitar strings. The important factor is various diameters - I know different sizes of fishing line also works. When the wind blows across the strings, it causes it them to vibrate. But unlike bowing a violin or plucking a lute or guitar (where the string sounds the pitch to which it is tuned), the wind causes harmonics to sound. When the Æolian Harp plays, we hear harmonics and an understanding of harmonics will be helpful in getting the best out of the instrument. 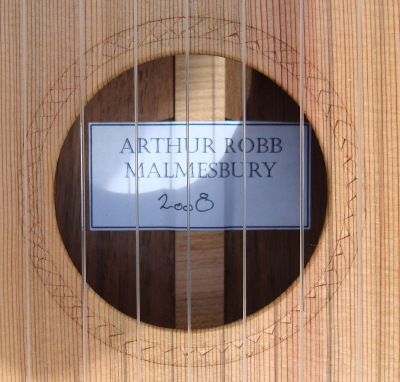 Tune a string to middle c and it will sound middle c when plucked or bowed. Middle c (in this example) is the 'fundamental'. Although less predominant, other pitches are also heard. The strongest harmonic is an octave above the fundamental. It can often be heard floating an octave above singing groups. The other harmonics are more subtle and give tone to the sound. Tone (the harmonic content of the sound) enables the ear to differentiate between the flute and the violin. The flute is a very pure tone with very few harmonics while the violin has many. The harmonics always occur in a pattern. The first harmonic is an octave above the fundamental; the second is an octave and a fifth above; the third harmonic is two octaves above. Then two octaves and a third, a fifth, a flattened seventh. Then three octaves and a second, third and on and on. If the string is tuned to c, the harmonics are c, c, g, c, e, g, b flat, c, d, e, etc. When wind blows across strings it is not the fundamental that is heard, but one of the harmonics. I can't tell you how or why, but that is what happens. The same phenomenon can be heard when telephone wires sing in a strong wind. Which harmonic is heard depends on wind intensity and the physics of the string; it's tension, density, length, pitch. 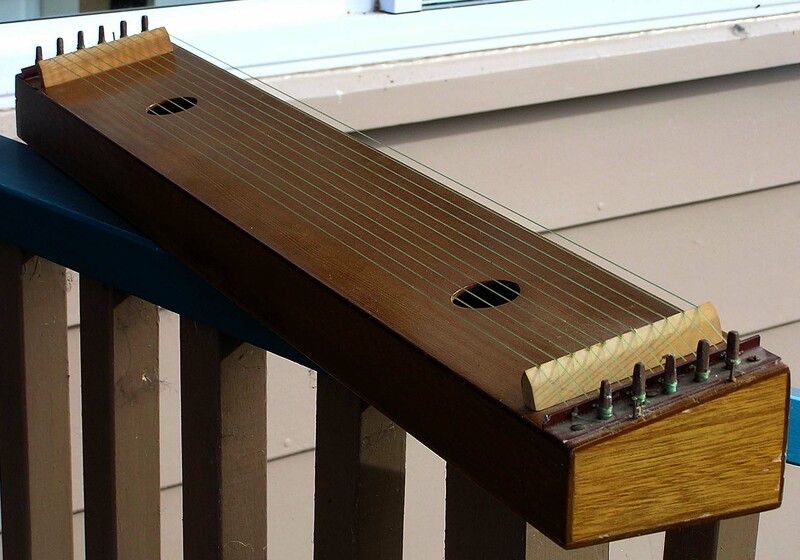 On the Æolian harp all strings are tuned to the same pitch, but have different tensions and diameters. Thus the wind will play one harmonic on one string, then a different harmonic on another, depending on the intensity of the wind. The changes of pitch seem quite ethereal and random, giving a very mysterious effect. I have had success with nylon strings. In strong winds, there was quite a din. I have also tuned half the strings to another pitch, so that there were two choirs, or two competing Æolian harps. Tuned a second apart was wild, a fifth apart probably most successful (standing out in a field in a howling gale with the harp held high above my head - to get into the laminar air flow). On the other hand, light winds, steel strings, also cause harmonics, but they are not very loud and we just can't hear them. I have heard some electronically amplified Æolian harps of all sorts of shapes and sizes which produced the most amazing sounds. 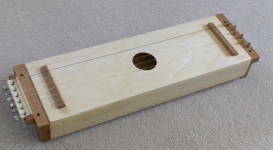 Of course it is possible to make an Æolian harp without any knowledge of physics, but physics is fundamental to understanding how an Æolian harp works. A description go harmonics will be in every basic physics text, as will the difference between laminar and turbulent flow. The strings will only respond to a steady and even flow of air. This is a laminar air flow. We see laminar flow everyday in the kitchen sink. Turn the tap on gently and water gently tumbles out of the tap - turbulent flow. Turn the tap on full and the water shoots straight down, the sides of the jet are parallel. This is laminar flow which can be seen. Air behaves in the same way but we cannot see it. 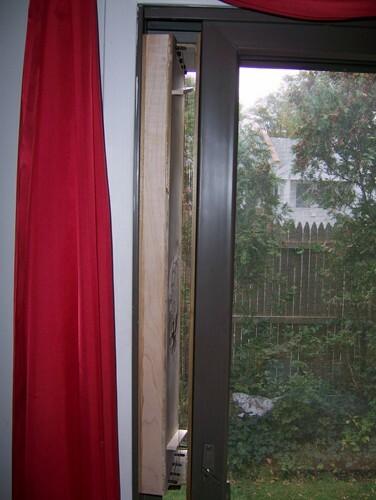 Laminar air flow occurs if a sash window is mostly closed. In a strong wind the air flow will be laminar. In a field in a gale, the wind is disturbed near to ground level by bushes, grass on other things. Six feet off the ground there is much more likely to be a laminar air flow. The harmonics will only occur if the strings are agitated by a laminar air flow. You begin to see why the harp won't play on a quiet summer evening in an enclosed garden. 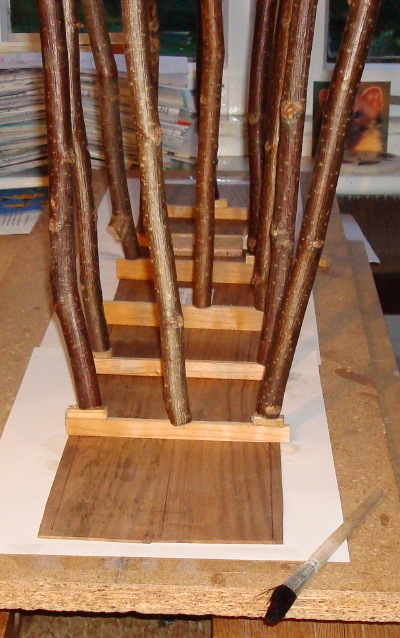 In 2008 I was asked to make to make an Æolian harp. 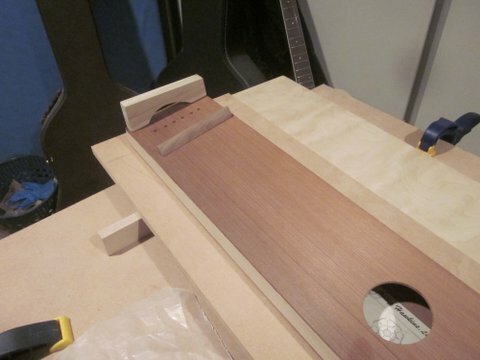 I chose English walnut for the body and western red cedar for the soundboard. 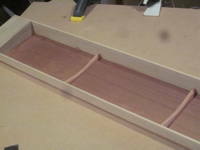 The lid was trickier than I expected as the thin wood was liable to warp. Plywood could be the sensible material, but the walnut, I think, looks very nice. In the end, it did not warp. It's 30" long to fit into a sash window in the customer's home. The finish is just linseed oil. Once again I found that 9 strings was enough to get an interesting sound and that the pitch did not need to be very high. The lightly built harp is not under very much tension from the strings. The design is my own, formulated before I saw Bruce Taylor's plan. It is, however, very similar. Phil is a guitar maker from Toronto. I'm an architecture student and also a fan of yours. Recently I found the diagram of aeolian harp in your website, it was so amazing that I also tried to make one. After finishing of the body with strings, I found it could be played by wind in the doorway, like aeolian harp. But when I added the cover, there is no sound anymore. Just wonder if you know the reason. Is it because of tension of string or the dimension? Thank you very much, looking forward your response. I suggested it might be due to there being only one bridge. This harp is 36 inches wide and I don't suspect size has anything to do with why it won't speak with the cover on. I built a wind harp, loosely following your plan, though simplifying it to suit my rather basic woodworking skill and equipment. It has 7 nylon strings, all tuned to the same pitch of G - I tried an open G chord (G - D - G on the next octave) first, but that didn't sound too good. I might try again when the strings have settled in and do not loose their tuning as fast as they do now. But maybe I just don't have enough strings on it. The harp was built as a gift for my wife's 33rd Birthday, built out of birch plywood. It plays rather nicely when it is standing in an open window and can get quite loud with a stronger gust, but mostly plays at a agreeable level in medium wind. I have yet to try it outside, but I think it will need something to turn it into the wind when that one changes direction. Thank you for your plans and tuning instructions. I would never have dared to build one without it. Thanks for the pictures, too. I have appended some of my wife's harp to this e-mail. You helped me make a gift that was very appreciated. Thanks again! Thanks for the interesting page. I built mine a little deeper hoping for stronger notes. It plays well at about 25mph winds. 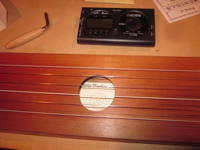 I tuned it to a six string chord using the nylons strings of a guitar set and set it vertically at a corner on my deck. It was so loud I had to take it down after an hour or so. The lid I made doesn't seem to work horizontally. An email from Russel W.
I have always been intrigued by Æolian harps, and I was glad to have found your "Little Æolian Harp Page." I actually first visited the page about a year ago, and I printed out the plans to build one. Well, I still haven't built one, but I did buy the tuning pegs and pins. The story does not stop here however. I was searching the auction web site, ebay.com about a month ago, and I found someone selling an Æolian harp. I asked the seller to send a picture of the harp, and what I received in return was the exact drawing from the Little Æolian Harp Page. I figured, "why build it when I can buy it." A musician I may be, but a luthier I am not. I received the harp just a couple days ago, and while it is only 22 inches long, it otherwise looks just like the drawing you have posted. I wish I could tell you who did build it, but all I can tell you is that it came from the state of Illinois in the USA. The weather here in California has been a bit rainy and overcast lately so I have not yet tested this harp outside. But it sure does sing when you put it in front of a fan[Another example of laminar air flow - Art]. Just thought you might want to know that someone did follow your plans. I wish I could say it was I. You can believe me when I say that the maker of this harp knew what he was doing. It is very well crafted. I actually downloaded these drawings from the Æolian Harp page a good number of years ago and built it just for fun. I became interested in them after seeing a programme on TV about some of the palaces in Granada where they had many water features and Æolian Harps. The harp turned out very well. It sang to its hearts content on the window ledge. I loved the sound but it drove my wife spare. As a kid I remember putting my ears to telegraph poles and listening to the wires hum. I must admit I haven't tried different tunings. I will now. I did read somewhere that you get good results if you tune the stings to the fundamental frequency of the box itself. Before putting the strings on, hold the box by one of the tuning pegs and using your knuckle knock the top of the sound board and try to establish what the resonant note of the box is. Then tune the strings accordingly. Abe wrote to say building this Æolian Harp kept him sane while while recovering from a broken ankle. 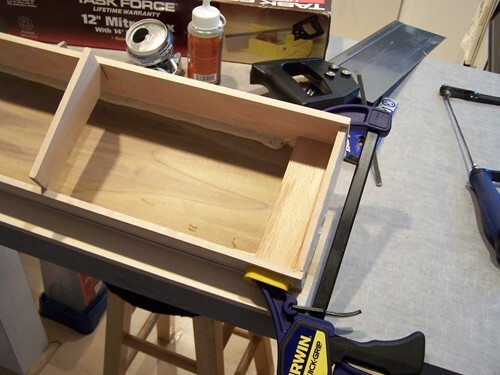 He used 1/4 inch poplar and Gorilla glue. I like the way he placed the harp in a sliding door. 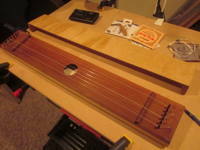 The harp will be a Christmas present for his mother who lives atop a windy hill in Pa, USA. 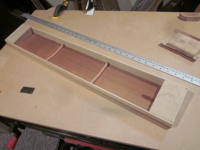 Hey Art, I liked your web page so much decided to make my own Æolian harp using your plan. I made two at the same time, both out of some lovely red silky oak - an Australian native timber I found in a shed on the farm and faced them with thin pale yellow plywood. 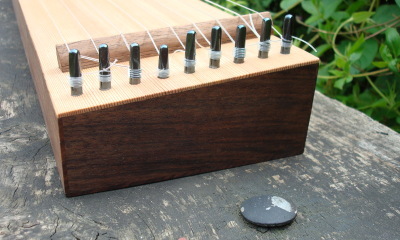 The strings go through holes at one end and double back to the zither-pins at the other. The harp is 1 metre long - just over 3 ft, otherwise made entirely to the measurements you provide in your plan. The bridges slope inwards changing the length of the strings, shortening them as they progress up the chord, so as to reduce tension in the instrument, it also means that the harmonics are different. The instrument shown here will be a wedding present for a friend. It plays beautifully in a light wind, but tends to go out of tune. The next one I make, I'll concentrate less on keeping the instrument light and concentrate a little more on rigidity in the body as string tension tends to bow the box and this makes tuning difficult. I wanted to tune it to the fundamental of the box which is C# but the tension was then too high and the thing bent badly. In one of my adult education classes, perhaps it was 1995, a student brought this instrument along. Instead of having a the usual lid, this Æolian harp has a second harp placed on top of the first.